The Harley-Davidson WLA was a motorcycle produced by Harley-Davidson for the US Army during the Second World War. It was very similar to the civilian version called WL but it was obviously adjusted to military use. The production ceased after the end of war. The production of the Harley-Davidson WLA for the US Army started before the Pearl Harbor Attack. However, only a limited number of WLAs were produced until the US entry into the war in late 1941. During the course of the war, an estimated 90,000 motorcycles were produced plus the WLC version that was made for the Canadian Army. The Harley-Davidson WWII motorcycles were also shipped to the UK and other Allies but the vast majority were made for the US Army. Although Harley-Davidson ceased to produce WLA after the end of war, the US Army ordered another series during the Korean War in the early 1950s. Many WLAs are marked as 42WLA even if not produced in 1942. Date of production, however, can be established on the basis of casting marks and serial numbers that can be found on some parts of the motorcycle. The frame doesn’t have any serial numbers and is thus virtually impossible to date. Colour and finishes. Obviously, the colour and finishes of the WLA were adjusted to the needs of the Army. Thus all WLAs were pained olive green, at the time the preferred colour of the military. Blackout lights. These were included to eliminate the problem of night-time visibility. Fenders. To make the motorcycles suitable for off-road riding, the WLAs lack the sides of the fenders. Accessories. The WLAs were of course added various useful accessories for the soldiers such as leg protectors, wind-shield, luggage rack, etc. However, not all motorcycles came with the same accessories. 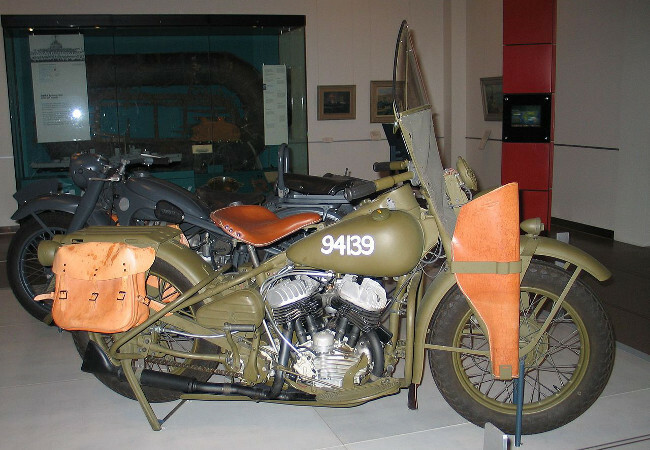 The WLAs were not the only motorcycles produced by Harley-Davidson for the US Army during the Second World War. Just before the outbreak of the war, Harley-Davidson began producing XAs which were inspired by the BMW R71. However, only 1,000 XAs were made because the US Army decided to use Jeeps and less expensive WLAs.